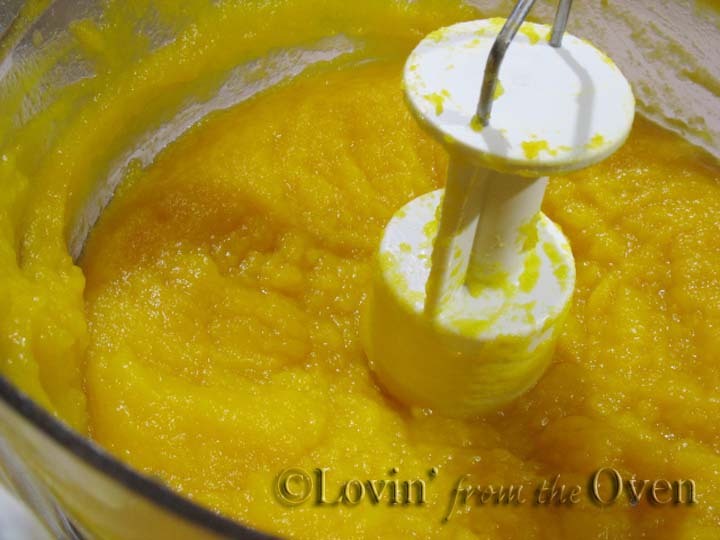 Frieda Loves Bread: Fresh Pumpkin Puree! Yes, opening a can of pumpkin puree is SO much easier, but is making it from a fresh pumpkin worth it? The folks who have tasted my fresh pumpkin pie think so. UPDATE! New Video! Now you can choose to watch the process or read the post. Recipe link is at the bottom of the post. Enjoy! 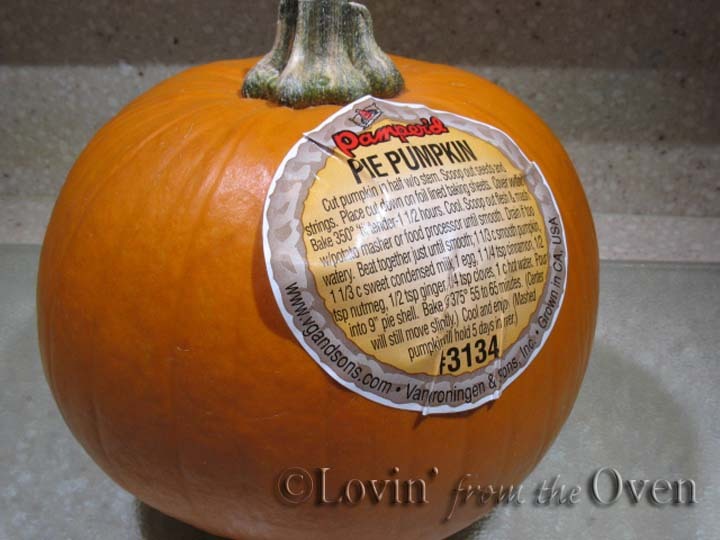 First, you will need a Pie Pumpkin, also known as "sugar" or "cheese" pumpkins. They are smaller, usually around 5"-8" across. Sure, you can use a regular "Jack-O-Lantern" pumpkin, but trust me, it will be more work, as they are stringy-er and more watery. This pumpkin was purchased at Sunflower Farmer's Market at 2 for $4. 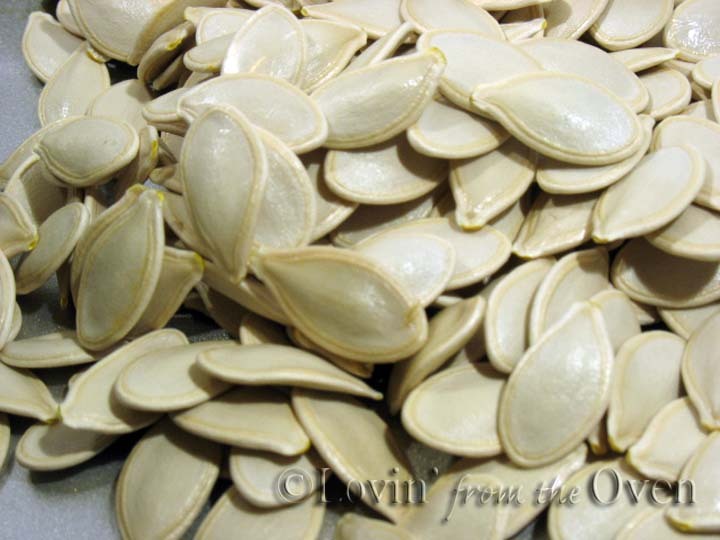 I have also seen them at Harmons and Smith's supermarkets for around .79/lb. Insert a knife at an angle near the stem base and cut all the way around. A serrated knife works really well in cutting the pumpkin in half. Other knives were more difficult to use. Trust me. I tried. 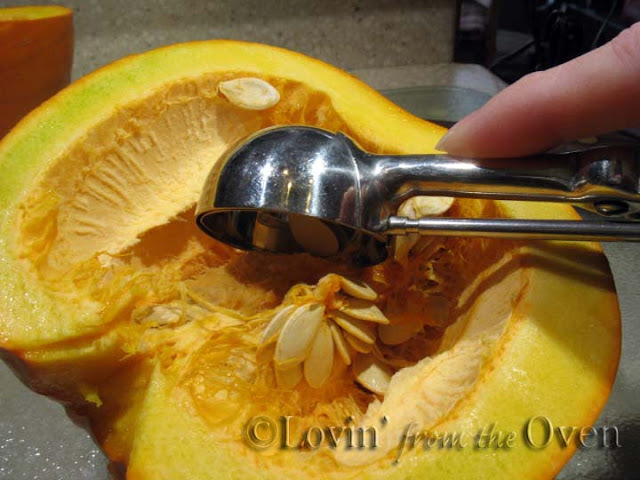 Scoop out the seeds and stringy stuff with a heavy duty ice cream scoop or spoon. Take each half and cut them into four pieces. Yes, that's a total of 8 pieces. That's the limit of my math skills, folks. 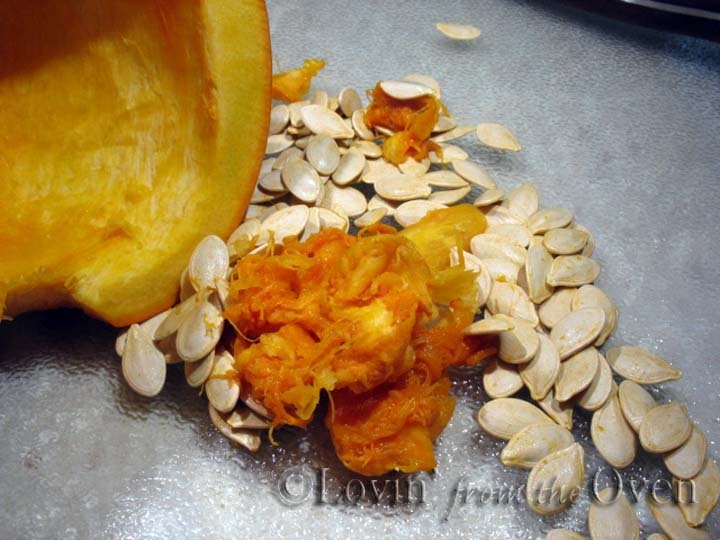 Rinse the seeds in a bowl of water, rubbing them between your hands to remove the pumpkin guts. Drain and rinse. 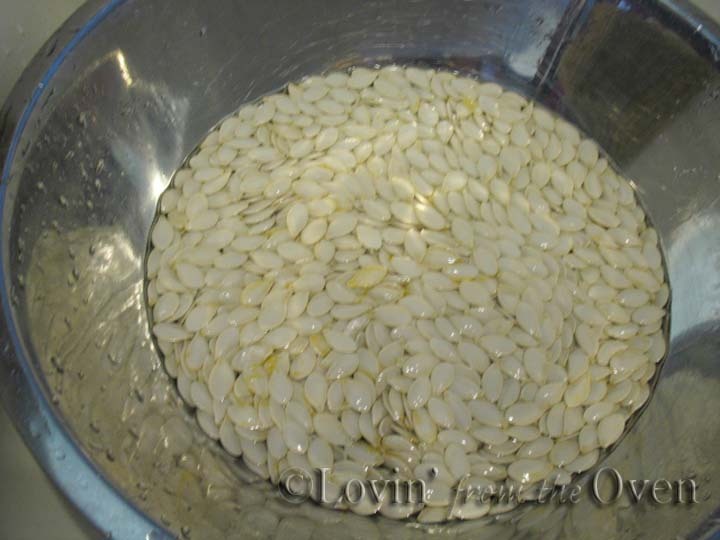 Lay the seeds to dry in a single layer on a clean towel or paper towel. Seeds can be roasted or saved for planting next year. There are a few different ways to cook the pumpkin: Microwave, steaming, in the oven, or pressure cooker. (Directions for all methods are included in the recipe links at the end of the post). I choose the pressure cooker method, as it takes the least amount of time and I just happen to have one. Put basket/grid in bottom of pressure cooker. Add just enough water to touch the bottom of basket. Electric PC: 1 cup of water into pot. Put in wire trivet. Cover and turn the heat to High. Once it starts hissing, reduce the temp to Medium and cook for 10 minutes. **Electric PC: Manual or HIGH pressure for 10 min, with a Quick Release. Release the pressure according to manufacturer directions. The pumpkin is fork tender, meaning that a fork goes through the pumpkin easily. Using a large spoon, scoop the flesh from the skin. 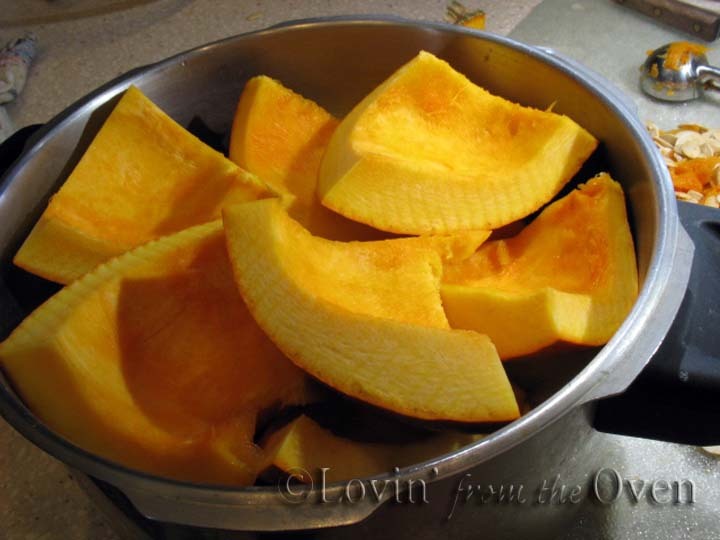 If the pumpkin has cooked long enough, it will scoop easily out of the skin. Put scooped out pumpkin into a food mill, processor or blender. Blend until smoooooth and creamy. It's already looking better than the canned stuff! Measure according to recipe and use, or freeze in Ziploc bags for up to 6 months. Yes, you can freeze this stuff! Two 5" pumpkins yielded 3 3/4 c. of thick, fresh puree. 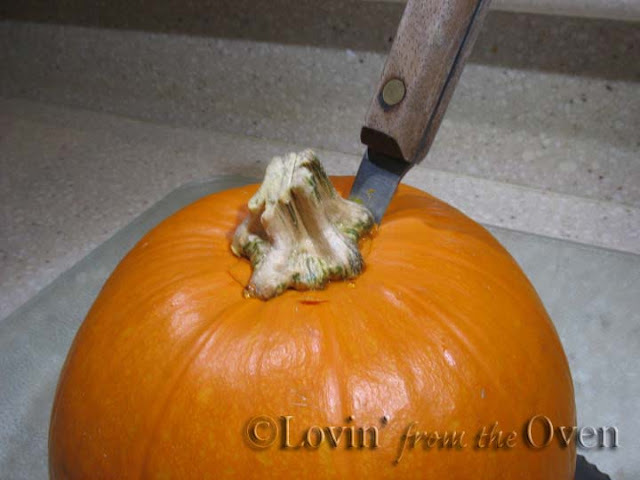 Cut stem from pumpkin. 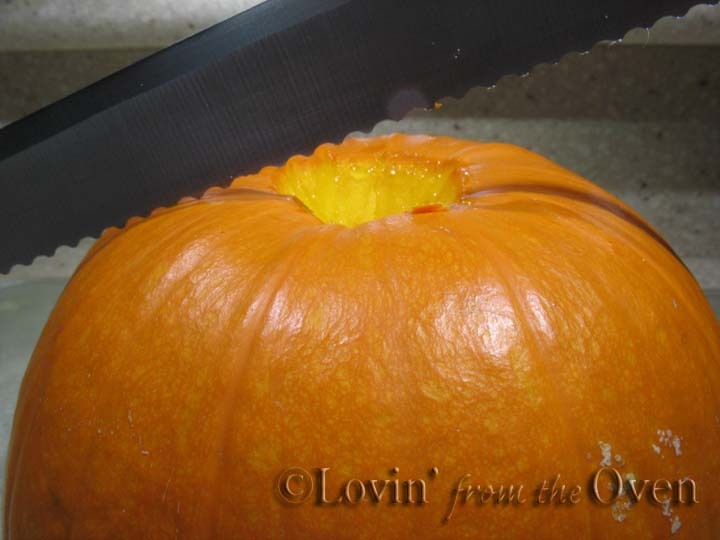 Using a serrated knife, cut pumpkin in half. Scoop out seeds and stringy pulp. Cut each half into quarters. Pressure Cooker: Put basket/grid/trivet in bottom of pressure cooker. Add 1 cup water. Add quartered pumpkin. Cover and turn the heat to High or set PC on high pressure. Cook for 10 minutes, with a quick release. Measure puree and use as directed in recipe. Measure and put in freezer Ziploc bags for up to 6 months. 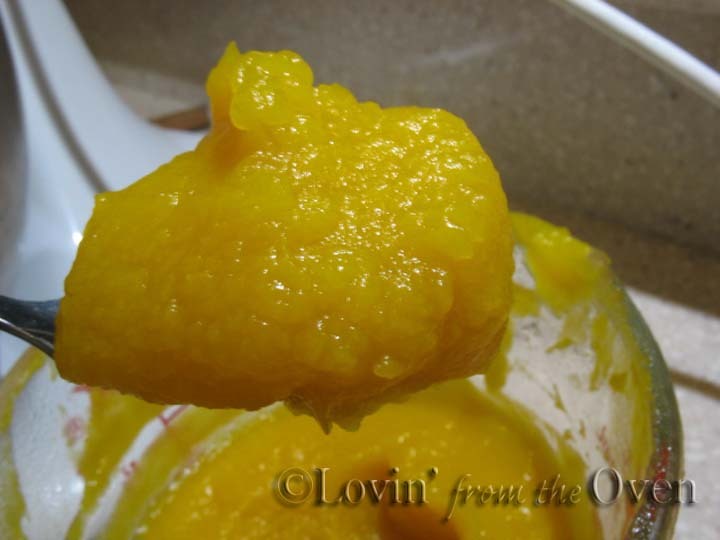 Use puree to make Pumpkin Pie, Pumpkin Chocolate Chip Cookies or stir into your favorite homemade yogurt. I love fresh pumpkin pie. I have found the sugar pumpkins watery. Do you let yours drain at all before using the puree? I find I need to let mine sit in a colander for awhile to let some of the water drain off. I also like cinderella pumpkins and jaradale and sweet meat for pie. 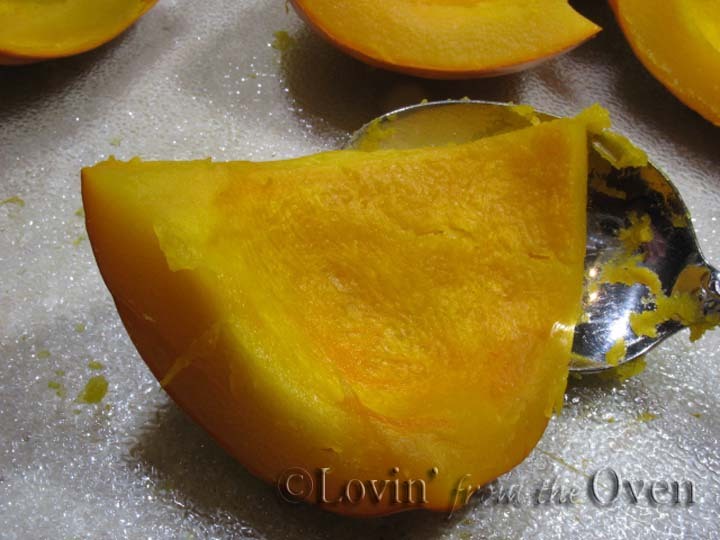 Have you ever used anything besides the sugar pumpkins? I forgot to say I love your new format. Bonnie, How did you cook your pumpkin? Could it have been watery because it was boiled or microwaved? Just because the pumpkin is "small" doesn't necessarily mean that it was a Sugar pumpkin unless it is labeled as such. I just roasted a "pie" pumpkin yesterday and made some pumpkin muffins with it. 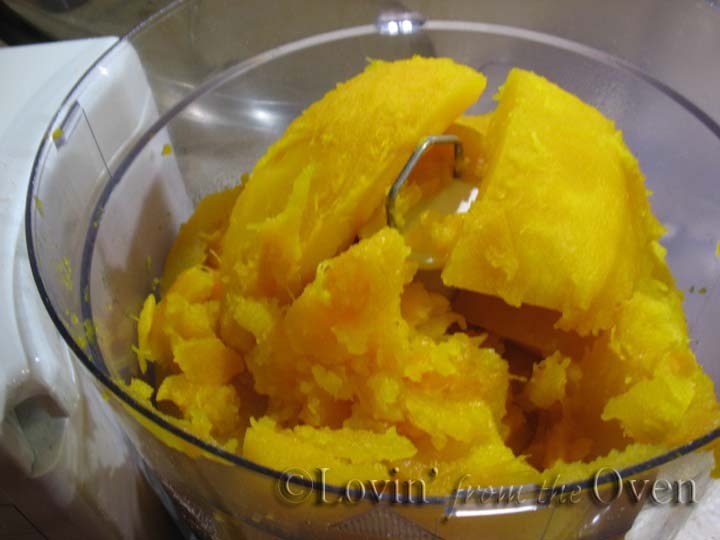 It was the first time I'd ever made my own pumpkin puree. Mags, Congratulations! I'm sure it tasted fabulous! Bonnie, Thanks! I'm glad you are liking the Fall cleanup of my blog! Wow, I'm inspired. 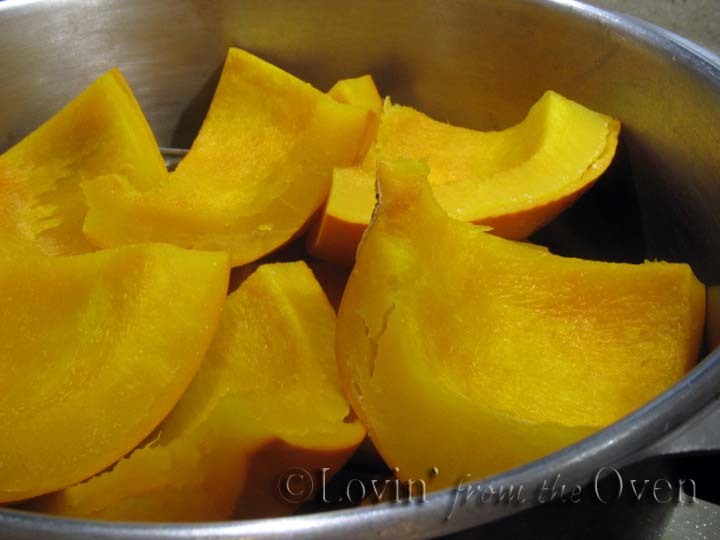 I think I'll make some pumpkin puree today. Ann, good luck. Let me know how it turns out for you! Can you recall if you planted the seeds the next spring? How did that go with harvest? I can't remember if we did or not....it's always worth a try!